For the past couple of hours I’ve been totally occupied with work. I’ve finally continued my vectorization of a picture I’ve been working on for a long time. I had done the body and face before, but today I finally got around to make the hair. Goddamn! Its really much work to vectorize that. But I’m very pleased with the way it turned out and I have a few things left. 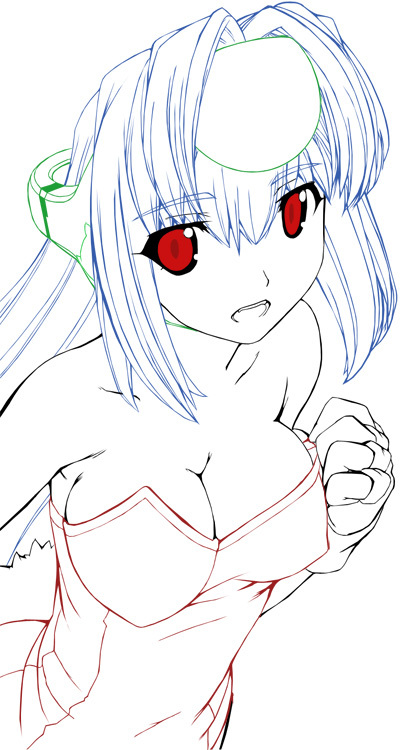 For those of you who don’t know the picture I’ve been vectorizing is of KOS-MOS from Xenosaga. I’m still missing some details on her headgear, will take care of that next. And I have to give draw her chocker. Since I’m going away later today, going to spend two days at a friends house. There will be no more work on this for now. After the rest is done all that is left to do is color this picture and upload it to DeviantArt, for the whole world to see. Hopefully people will enjoy this picture also. This will also hopefully be the first of a few KOS-MOS vectors. When I’m done with all, I’m going to create an image gallery here on the site for the pieces of artwork that I’ve made. Well at least I’m going to have the stuff I’m most pleased with. Enough talk, enjoy the picture. Please comment it if you feel like it. And after that all that is left to do is color this picture and upload it to DeviantArt, for the whole world to see. Wow, you are very talanted. Keep up with theese great pics of arts. And happy new year, Micke! I really appreciate those kind words.